A lot of times when you see TV sponsorships, the creativity ends at sponsored vignettes and some online content. 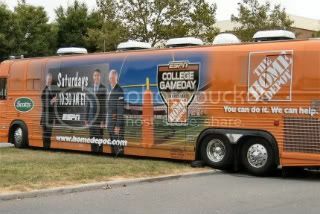 ESPN's College Gameday Built by the Home Depot, which has been evolving since 2003 and today enters its 23rd season, is one of the best examples of a truly integrated sponsorship originating from a media buy. ESPN (and by virtue of title sponsorship) Home Depot have worked hard to innovate the show into something that is fun, passionate and inviting to all college football fans. It's no big surprise that ESPN is the best at integrating partners into experiential since most of their programming is rooted in live events. 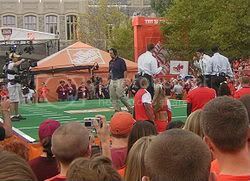 While the show has always been a hit with college football fans, the show really took off in 2003 when Home Depot came in and created a set into an entire Gameday experience and cultural icon. When you consider the infrastructure needs required and the fact that ESPN has annually found new ways to extend the program, Home Depot's "reason for being" is a pretty evident. It's not just a sponsor plug, Home Depot actually did design and build the Gameday set, which needs 8,500 square feet of space to hold equipment and staging for two mobile units, two office trailers, a generator truck, a satellite truck, the Home Depot bus, the main stage, an even larger demo field stage, a video wall, four tents, crowd barricades, cable ramps, public address system, and air conditioners. The set up also requires 22 telephone lines to the main stage, and nine to the in-stadium stage as well as security, catering, portable toilets, golf carts, a fork lift, a copy machine, and parking for 25 cars. Home Depot has special seating on the set of Gameday, which is used for HD VIP's in each market the show visits. Home Depot branded content extends to all of ESPN's properties including a co-branded website, ESPN Radio, ESPN Wireless, ESPN Podcenter for a College GameDay Podcast, and ESPN The Magazine. A simulated football field, HD video screen and Home Depot branded bus accompanies the set to every college campus it visits. The sponsorship was started in 2003 and renewed in 2006. If there's one area that Gameday could be dropping the ball, perhaps it's http://twitter.com/gamedayfootball. Look for more integration into the broadcast as the season goes along.